PAUL JAY: Welcome to The Real News Network. I’m Paul Jay. 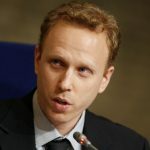 The award winning journalist Max Blumenthal was in Venezuela for around three weeks recently. He came back to the U.S. and headed right off to Geneva where he made a presentation at a meeting, sort of a side meeting, at the Human Rights Council. And now he’s just back, just got off the airplane last night, and he joins us. Thank you, Max for coming in. I know you’re exhausted. Max, as I said, is an award winning journalist. And his book, which is just about to come out, is called “The Management of Savagery.” Thanks for joining us, Max. MAX BLUMENTHAL: Thanks for having me on. PAUL JAY: So Max, tell us about why you were in Geneva, your presentation there, and the current politics of what’s happening in the media, and in Europe as well, as it relates to Venezuela. MAX BLUMENTHAL: Yeah. Thanks, Paul. I headed off to Geneva about a week after returning from Venezuela. Then during that week, Venezuela experienced its mysterious blackout. So, I went to Geneva as part of a panel that was a side event of the general session of the Human Rights Council called “Venezuela: Propaganda Versus Reality.” It was sponsored by the International Association of Democratic Lawyers. Alfred de Zayas, a former U.N. Special rapporteur who did a pathbreaking report on Venezuela and the impact of unilateral coercive measures, like U.S. sanctions, was on the panel. My colleague Anya Parampil was on the panel and a Venezuelan NGO leader who is an expert on the impact of sanctions also spoke on the panel. My presentation focused on corporate media lies and how they were deployed to drive the interventionist narrative after Juan Guaido was declared by the U.S. and its kind of European partner states as the interim president. I focused on deceptions like the one that occurred on the Santander Bridge on February 23, when aid trucks that were holding U.S.aid Were burned, and it was obviously burned by the violent hooligans who were ferried onto the bridge by Colombian security services. They burned it with their Molotov cocktails. We saw it. Telesur was among the organizations that reported it. And The Grayzone was, I think, the first English-language publication that noted that they burned their own aid trucks, while Colombian President Ivan Duque, USAID Director Mark Green, and U.S. Senator Marco Rubio were saying that Maduro burned the aid trucks. And then, The New York Times basically confirmed what we had reported two weeks later after its own correspondent in Venezuela, Nicholas Casey, actually fell for the lie that Maduro burned the trucks. There have been other deceptions since then that I talked about, such as that poor Venezuelans were going to sewage pipes and drinking out of dirty sewage drains during the electricity blackout because the collapse of the Guri Dam Hydroelectric Plant made it hard to pump water. So Venezuelans were looking for other means of getting water but what I showed, which was actually first shown in English by the website Venezuelanalysis, is that they’re actually getting water from a fresh stream that they regularly get water from and that this picture was actually framed in a way that was not only deceptive, but completely false. And, it was also framed in a way that made U.S. readers think that the poor and working class of Venezuela are stupid or dirty because they would drink out of raw sewage. And so, that was really the point of my presentation, in addition to talking about what I found on the ground, which is something that Alfred de Zayas talked about at the beginning of his presentation. That, while we were both very skeptical people and looked at the Venezuelan situation from a very critical perspective, we both expected to see much more of a dystopian situation than what we actually found when we got there. And when we arrived, we saw a semi-functional society that stood in stark contrast to what had been presented to us in Western media. PAUL JAY: The New York Times article which exposed–it wasn’t the first, but in terms of mainstream media–exposed this fire on the aid truck. It’s a rare moment because it’s such a universal onslaught against Venezuela in the press and so many countries have recognized Guiado. My memory is in the lead up to the Iraq War. There were far more fractures both in the media and certainly in European politics. How do you account for such a universal buying into this essentially attempted coup in Venezuela? MAX BLUMENTHAL: Just on the point of the deceptions, for The New York Times to come out and confirm what we reported, what The Real News had stated, what so many in Latin America knew to be obvious about the burning of the aid trucks, was sort of remarkable because The New York Times has been a party to so many deceptions on Venezuela, on Syria, on Nicaragua, and going back to the war in Iraq with their notorious reporting by Judith Miller. And, the deceptions continue in pretty much everything reported by Nicholas Casey. The latest New York Times deception is Nicholas Casey reporting with very thin sourcing, that Cuban doctors were used and brought into Venezuela to coerce votes for Maduro. And so, The New York Times is basically a factory of deception. The whole U.S. media has gone along with the Venezuelan opposition’s narrative of a humanitarian crisis. And that was another purpose of my presentation and Alfred de Zayas, who went to Venezuela as a former special rapporteur to explore all sides and see the situation from the ground. He went into supermarkets, as I did, as a common civilian. He went into food markets in working class barrios, as I did. And what we didn’t find was a humanitarian crisis. And it’s always the narrative of humanitarian crisis that’s drummed up to generate popular support in the West for some kind of Western intervention. What we did find was that there was an economic crisis. Everyone knows this to be true. No one on any side in Venezuela denies it. But a humanitarian crisis? Not something that I saw. It’s something we see in Yemen. It’s something that I saw in the Gaza Strip. And this phrase is really at the heart of the deception that I think helped stimulate European support for the U.S. coup attempt, which is the most naked coup attempt I’ve ever seen in my lifetime. I didn’t live through Allende and Pinochet. But it was just such an obvious coup attempt. And, it wasn’t shocking to me that the E.U. states went along with it, partly because they are in the E.U. and the E.U. Is basically set up to deprive all of these states of their independence and make them vassals of the United States. And what they did was they were coerced into a scenario, or allowed themselves to be brought into a scenario where Venezuela was not only facing the threat of a war that all of these E.U. states say they oppose, they oppose a Libya-style intervention, but also faces now a deepening economic war, which as even Michelle Bachelet, who is the U.N. High Commissioner for Human Rights, has said in very weak language, is deepening the crisis that all Venezuelans face on a socioeconomic level. And so, really, this is just a colossal failure of the E.U., and it really reveals what the E.U. is and what kind of a mechanism it was set up to be, and it’s to help recolonize the Middle East and Latin America on behalf of the U.S.
PAUL JAY: Now, a lot of the reporting is on the amount of people, Venezuelans, that have left for Colombia. We’re told in the hundreds of thousands. Is this true? And if so, why, if it’s not a humanitarian disaster? And it’s also possible, I think you’re mostly in Caracas, is the situation worse outside of Caracas? MAX BLUMENTHAL: The situation is worse in the western areas of Venezuela, especially in the border areas where there just isn’t as much government intervention. But as I said, it’s an economic crisis. The problem is the buying power of the Venezuelan public has been ruined because currency has been destroyed. The government can’t get out of the economic crisis because, as everyone from government ministers I spoke to Mark Weisbrot, who is one of the leading experts on the Venezuelan economic situation and a harsh critic of some of the mistakes the government made in 2015, 2014, as they acknowledged, sanctions just simply make it impossible to get out from under the economic crisis. Those who have left Venezuela are mostly economic refugees. Many of them are middle class people or lower middle class people who’ve taken things with them, and some have even taken advantage of the black market economy to sell free gas on the Colombian side of the border. People are even selling the free CLAP boxes, which are boxes of food and sanitary supplies that the government distributes once or twice a month to some six million families on the Colombian side at market rates. So there’s this black market economy on the border where there is the outflow of Venezuelans that’s really helping drive the economic crisis, and it’s also been a boon to sectors of the economy that are completely private and are unaffected by state policy. The company Polar, which is one of the largest companies in Venezuela, is helping set prices in a way that makes goods really inaccessible to many Venezuelan consumers, and also participates in the speculation. So they, themselves are kind of cashing in and these are often companies that support the Venezuelan opposition. I think one thing we have to recognize, and this is what I tried to show in my videos going to a supermarket in the upscale Altamira neighborhood in Caracas, or going to a luxury shopping mall in Chacao, which is another district in Caracas that’s an opposition stronghold, is that capitalism is robust in Venezuela and two thirds of the economy is controlled by private finance and capital. What the government has been able to do is a very limited intervention. You could call it democratic socialism, but it certainly isn’t this Marxist-Leninist, communist takeover of an entire economy. PAUL JAY: Just to add to the sanctions, the seizing of Venezuelan public wealth, the gold deposits in England, Citgo in the United States. 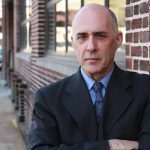 I saw Mark Weisbrot has a report, I think today, on a massive reduction in oil production because the sanctions have simply cut down the ability to export oil. MAX BLUMENTHAL: Yeah. I mean, we’re talking at least six billion dollars in assets since Barack Obama bizarrely declared Venezuela a national security threat in March 2015. Six billion in oil assets; they’ve lost that much. You mentioned the Bank of England refusing to return $1.3 billion in gold assets. I think we saw Citibank is now saying that it’s going to sell off Venezuelan loans. We’re seeing U.S. withholding five billion dollars of medical supplies, according to Maduro. This is the money that the Venezuelan government uses to buy medical supplies to combat scourges like malaria that we have seen spreading in the western areas of the country. So this is an attack on Venezuelans of all classes. The U.S. is threatening to sanction Visa and MasterCard, which towards the end of my trip in Venezuela, I relied on my MasterCard just to basically buy food, because I’d run out of cash. 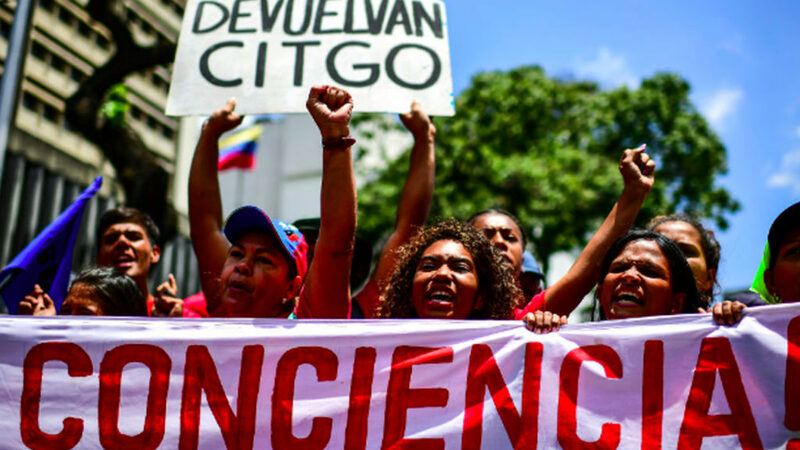 So there’s simply no denying that these sanctions, contrary to the what the U.S. government is saying, are affecting Venezuelans at all levels, while the U.S. is selling them as simply an attack on Maduro and his inner circle. And I want to point to kind of one comment that was actually made to me by Nicaraguan President Daniel Ortega when I interviewed him that I find so relevant to this situation, which is that when the U.S. first came in to sanction Nicaragua, they applied the Magnitsky Sanctions, which are sold as targeting the inner circle of rogue regimes. And what Ortega told me was that the Magnitsky Sanctions made the business community in Nicaragua terrified of doing business with anyone or any entity connected to the government and it’s what laid the basis for the coup attempt, the sort of soft coup attempt in Nicaragua, where the business community lined up with the Nicaraguan opposition when many of many business leaders had previously been on Ortega’s side. So that’s what Obama’s sanctions initially did in 2015, was to pit the business community against the Venezuelan government. And now were seeing, under Trump, just an all-out attack on the financial sector and the Venezuelan economy and its ability to interact with the global economy on any level. PAUL JAY: All right. Thanks for joining us, Max.